The American English Coonhound breed descends from Irish and French breeds brought to America. They were utilized to hunt fox by day and raccoon by night. The original Coonhounds were inadequate when hunting by American standards due to their inability to track quarry in trees. Therefore, the original breed was crossed with the Bloodhound to enhance their scent tracking ability. 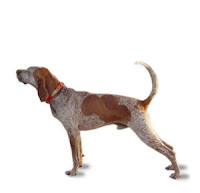 Today American English Coonhound's are used to track and hunt raccoon, oppossum, cougar, deer, boar, and bear.